Well, that was a depressing book. Or was it? Charlie LeDuff, after years of living away from his hometown of Detroit, decides to move his family there when he feels that LA is becoming too crowded to raise his daughter safely. Obviously, my first reaction was thinking why he would think Detroit is a safer city than LA? Maybe it's because I live near Detroit and have been there and have seen the decline and fall of the city over the last couple of years. It's not like I go there on a regular basis, and it's not like it's ever been a really safe city to start off with, but over the last couple of years, you can clearly see the city struggling to better itself while at the same time falling apart at the seams. Maybe LeDuff really didn't know how bad things were when he decided to move home, but he certainly got a shock with how bad things are there, and through his journalist's eye, he takes us on a tour of some of the even less savory stories coming out of the city. What he shows us is a city in far worst shape than I had imagined. There seems to be corruption at every level of government, huge corporations that can barely manage to keep themselves afloat, the police and fire departments are using outdated or damaged equipment, violence running rampant in the streets, people too poor to bury their dead and leave the bodies in the morgue until they can scrape enough money together for a cremation. One almost begins to feel that there is no hope for the city of Detroit, and I found myself wondering throughout the book why LeDuff, or anyone living in Detroit for that matter, doesn't just pack up and leave? In the end, thought, LeDuff shows us that there are still a handful of good people in Detroit, and that there is a glimmer of hope, however small, and that maybe this is why people stay. Or maybe it's because Detroit is all they know. Or maybe it's because they are too poor to move away and are simply stuck in their situation. Sounds hopeless, right? That's how LeDuff's book is: It gives us a taste of something maybe good in the town, yet there is always something bad right around the corner to take it away. Personally, there's nothing redemptive for me about LeDuff's book. I feel like they should close down the city, move the people away, and let nature continue its reclamation. But where would the people go? Would their lives be bettered in any way by moving them to a new home? It's hard to say, but much like LeDuff tries in his way to do some good, I feel something should be done to the city. Anyway, I don't know that this is necessarily a hard book to read. LeDuff writes his book in much the same way I imagine he writes his columns for various news outlets: the sentences are short, to the point, and filled with what I perceive as journalistic tropes. But LeDuff gets his point across. 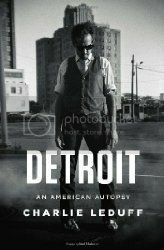 I'm not really sure what the point is, as there seems to be no conclusion to his narrative, but I felt like I understood Detroit a little better after reading this book. I know very little about the city of Detroit, outside of the basics. Your review makes me want to read this book. I have just started reading by Charlie LeDuff. I'm only two chapters in. This is an incredible book, worthy of Charlie LeDuff's moniker. You don't seem to give him credit for how good his writing is. You love books I get from your blog. What I think you might want to appreciate is how LeDuff's vivid, terse writing creates crystal clear images of the people and the landscape of Detroit. LeDuff doesn't suppose to be anything other than what he is: a snoops, a guy who makes money from being on the ground capturing the misery he sees. He isn't showy; his writing doesn't say look at me. It says "Open your eyes and get a taste of this." It's not about whether the Detroit he sees is a good story. It's capturing with words what you and I in our comfortable distance outside of Detroit don't see or choose to ignore when we drive straight past on our way to Cobo or the Fisher or Motor City Casino. As someone who appreciates good writing (as I assume you do) I am surprised you didn't mention how good a writer LeDuff actually is. Monique - Thanks for stopping by. I don't know much about the city either, but like I said, I think LeDuff makes it clear just how bad things can be in the city. Give the book a try if you want to learn more about he goings on in Detroit that the average person probably wouldn't be aware of. Christian - I'm sorry my review and experience with reading LeDuff's book didn't match your same experience nor meet your requirements for how I should have experienced and/or understood the book, but thank you for at least checking out my blog! I grew up just outside Detroit and have been meaning to read this. I'm afraid that it will be frustrating, though, because (as you said) there seem to be very few solutions written in the wave of these books on Detroit. It seems like it's worth looking into, though.